Frederick Taylor’s ideas of “scientific management” caught the business world’s attention in the early 20th century, at a time when industrialisation and large-scale production technologies were being adopted. His insight that “the principal object of management should be to secure the maximum prosperity for the employer, coupled with the maximum prosperity of each employee” planted the seed of “people management”, which Peter Drucker and others built on in later decades. 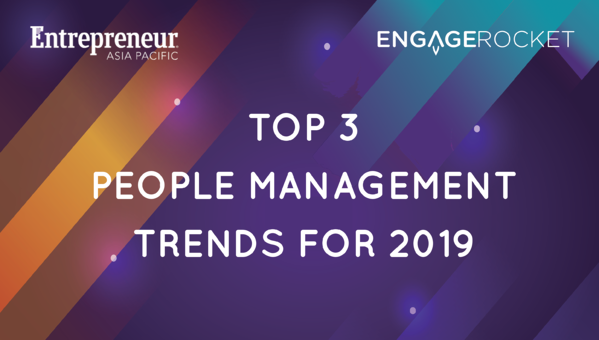 As we start 2019, here are three trends that will dominate our thinking on how we manage people better this year. We spend large amounts of time, effort and money trying to understand customers and personalise their experiences — who they are, what they respond best to, how to keep them happy and even how to get them to recommend your brand to others. If employees are dedicating more than 40 hours per week to help your company achieve its goals, wouldn’t it make sense to use similar techniques to understand and motivate them at the personal level too? In 2019, the movement to create personalised employee experiences is gathering significant momentum. Chip and Dan Heath, professors at the Stanford School of Business, point out the missed opportunity for engagement that is an employee’s first day at work. Beyond the first few weeks of "on-boarding", employees go through other stages like receiving their first performance appraisal, taking on new assignments or projects, getting a raise or promotion, learning on the job and even eventually separation. The common interface for all these experiences would likely be their immediate manager. Equipping managers to move away from a one-size-fits-all approach to management to a one-size-fits-one approach would improve the quality of these "moments of truth" and improve employee loyalty and productivity. Studies have found that organisations who are more advanced at using data to analyse the workforce proactively, make predictions, create and monitor comprehensive workforce plans make 56% higher profit margins than less advanced organisations. Traditionally, people management has been more art than science. Leaders, if they are fortunate, undergo management training to get them up to speed on best practices. In most aspects of leadership though, the question of how to motivate and retain their people has relied heavily on personal experience and judgement. Especially in Asia, where employees tend to be less forthcoming with their opinions about their bosses and management, may have no way of telling if their recent town hall adequately communicated their vision, or if the performance feedback they gave was well received, or whether their team is clear about what needs to be done to achieve their objectives. Two major enablers have come on to the scene to allow leaders to be more data-driven. First, the speed of data collection and analysis has increased significantly, allowing for more timely information to be delivered to leaders. For example, previously bosses had to wait for a year or two before results of an employee engagement survey were delivered to them. This made it unclear which of their actions were actually helpful and prevented them from taking immediate action on time-sensitive feedback. Unfortunately, this is still common practice in many organisations. Pulse surveys, shorter, ongoing surveys that measure employee sentiment and culture in real-time, allow bosses to instantly understand their teams and act to keep them motivated and aligned. Second, business intelligence technologies have evolved to the point where having a unified view across different data silos is possible. It has become easier than ever before to track the experience of each employee across the different stages of their journey with the company and deliver insights about how to engage them better directly to their managers. Drone operators, data scientist, social media managers, these are just some examples of jobs in great demand today that didn't exist 10 years ago. Those decades of experience on your resume may count a lot less when dealing with new areas of work that your team members are now responsible for. As important as it is for your team to be competent in their current skills, encouraging them to nurture the ability to learn new ones has become an economic imperative. The average lifespan of an S&P 500 company is now less than 20 years, down from almost 60 in the 1950s. This suggests that companies need to keep innovating just to survive, requiring new skills and expertise. These also apply to soft skills. As technology advances, the ability to work in teams, balance demands from multiple stakeholders, communicate effectively, think creatively, and others, have become more critical, not less. Part of the responsibility of people management comes being responsible for the growth and development of the people you manage. Encouraging them to develop new relevant skills also has the important benefit of improving engagement and retention: 87 per cent of millennial workers (born after 1982) report that development is "important" in their job.